The new year is a perfect time to start a new exercise routine. To help you reach your goals, we spoke with Sean Downey, senior editor of Runner's World, to find out what features are worth the extra money when shopping for running gadgets. "Make sure you have a good range of features on your watch as far as configuring your heart rate zones and different ways to train within those zones," Downey says. According to him, most devices base your heart rate zone on your age, which isn't an accurate method — you can have a heart rate that's better or worse than your age. "That's more like a ballpark figure that some watches or treadmills use." "A lot of people don't like running with things attached to them, so if you're going to use an armband or belt clip, make sure it's comfortable. 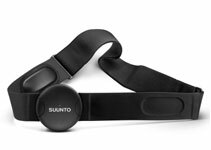 Try chest straps from companies such as Polar and Suunto." Downey stressed the need to be alert when running and says to avoid the noise-cancellation technology available in many headphones. "You want to be aware of your surroundings," he says. "You don't want to block out any sort of noise. Even when you're on the treadmill you want to be aware of what's going on around you." "When facing choices between devices that display instantaneous pace versus average pace, go for average pace. If you have a display in average pace, then you get a better idea of how you're performing mile after mile as opposed to every 25 feet or so." Although not that many watches come with temperature gauges, Downey says to stay away from them since they're not that accurate. 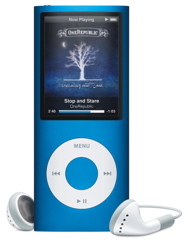 Downey is high on the Apple iPod nano 8GB MP3 Player because of its compact size, excellent features, and compatibility with iTunes, which now has a Genius function to automatically recommend music to download. The nano works with the Nike + iPod Sport Kit, which provides an inexpensive speed and distance solution. If you're not an iPod fan, Downey also recommends the SanDisk Sansa Clip MP3 Player. It's slightly smaller than the nano, while offering plenty of capacity for the price. Downey also mentions Internet radios, such as the Slacker G2 Portable 4GB Internet Radio. It allows you to download music automatically and mix up your playlist. Plus, you don't have to pay for every song like you do with the iPod. When running in the early morning or at night, consider using headbands and armrests that light up. This will keep you safe while conducting your workout in the dark. Downey recommends doing without a pedometer that attaches to your belt because they're rarely accurate. He notes that they do work well for low-impact activity such as walking, however. "I haven't really seen a pedometer that's great for running," he says.